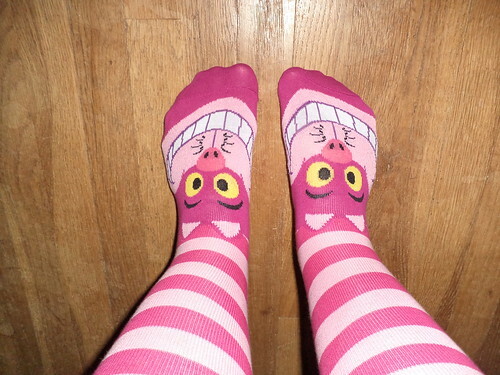 I had to come home from the Disneyland trip with socks. The first store I went into where I was going to spend serious cash (or not so serious cash since I'm buying cat socks) had these. Sold. I didn't look at socks after this. Cheshire chat has always been one of my favorite literary characters. "Here's looking at you, kid"? Or how about this? When I got home from Anaheim and went to add the Cheshire socks to the drawer, I took a moment to look through all my socks. I have had some for decades. They wear like cast iron. So as long as there isn't a hole in a toe or the heel isn't threadbare, I will keep them. But there were some I just could wear any more. They hadn't quite reached the point of no return, but were close. I wound up adding 4 pair to the give away bag. This is good because Carole and Larry gave me a couple pair for my birthday. 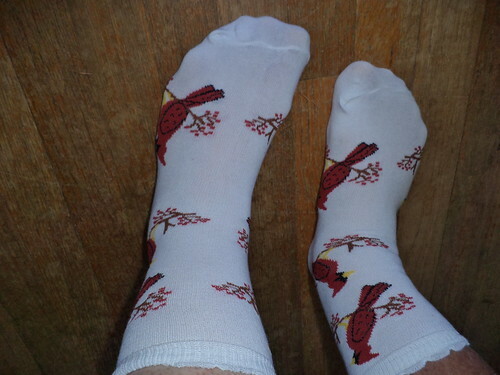 Cardinals are generally thought of as a Christmas bird, but I'll wear these all year 'round. 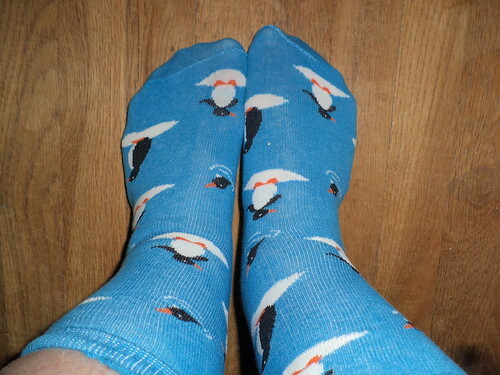 I wear my holiday themed socks any time of the year. Why keep them hidden? I should do another run through the drawer. I have some socks that, when I pull them out of the drawer, I toss back in. They aren't favorites anymore. I could replace them with ones I'd look forward to wearing.